Guess what. 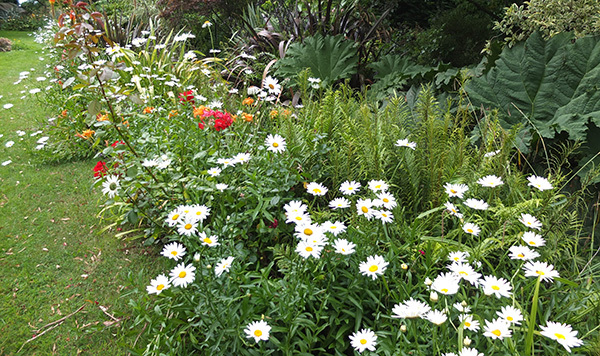 The lovely Shasta daisies are in bloom. Of course, I love them lots. But guess what? I have about four weeks to finish trimming the Lychnis. Why? Because then all my time will be spent 'sorting out' the Shastas. Aargh! One thing after another! This morning, so far, I've done some industrial strength gardening in the house patio gardens, watched by the kittens. Out, out, out - I've pulled loads more Lychnis out, leaving behind the dryest, most non-nutritious looking soil. So I've poked and prodded with my hand digger, and tipped out pots of old potting mix, anything organic, over these gardens. The poor house roses have been smothered underneath Lychnis. I'm shifting the hose every ten minutes. Back soon. I cleaned up all my mess, even yesterday's piles of Campion by the laundry line. And then wandered nonchalantly over to the pond, clutching plastic shoes (the pond bottom is muddy) and towel. The water was sooooooo cold! Never before has a hot gardener slithered into her large irrigation pond so slowly. It was at least ten minutes before the shoulders were under. Brrrrr! I dog-paddled bravely around for about a minute, then off back to the house to wash hair, shower, and warm up. And then (in my clean clothes, white cotton top and good sandals, oops) I did some more gardening. Aha! Surprise, surprise! I pulled out another two barrowfuls of Lychnis, and shifted the hoses around some awfully dry and dusty gardens. At the moment I'm watering two sad roses in the patio garden (old Master, and I think English Elegance). Shush - don't tell them. Tomorrow they are moving into The Hump. And out of the Hump is coming one of my recycled roses, only planted three months ago, which is obviously a rampant ground-cover rambler (it's possibly Nozomi). Oops. And ouch! Not very pleasant to walk past or weed under. 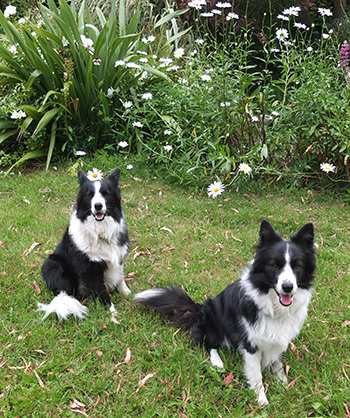 Picked some Shasta daisies that had flopped over, then remembered that they smell of cat pee. So had to add an armful of sweet peas (so fragrant) to their vase. Nasal confusion, hee hee.